With all of 6850 housing units, Floriande is the largest ‘Vinex’ site in Haarlemmermeer. The first part in place consists of 12 islands with some 300 units apiece. 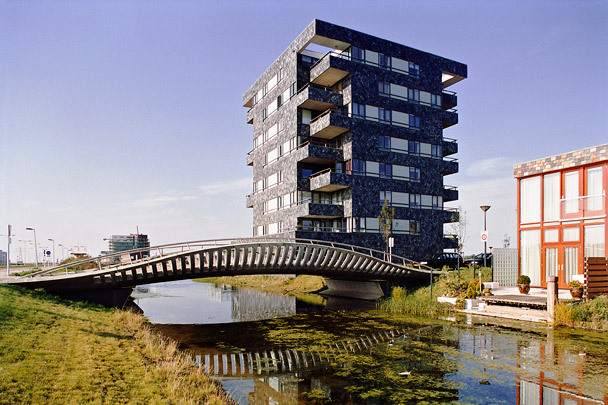 Each island is reached by a bridge (designed by Zwarts & Jansma) and marked by an apartment building in a salvo of vertical thrusts. Each island has its own theme - ‘garden village’, ‘dignity and style’, ‘dwelling as a voyage of discovery’, ‘dwelling on the village green’, ‘polder’ and so forth - which is expanded upon by an architect and a landscape architect. Island 5 is strictly out of bounds to government architecture-vetting committees. The apartment building here is interpreted as ‘stacked do-as-you-please plots’.